Andy Robson was born 1977 in Berlin. His civil name is Andreas Pusenjak. His stage name Andy Robson was found in the late 90ties. His mother is of English origin so he simply took on her maiden name: Robson. Early on music played an important part in Andy`s life. His father Gary was a semi-professional musician in Berlin. Music was omnipresent, at home they played and listened mainly to rock`n`roll, rhythm and blues from the 50ties and 60ties. 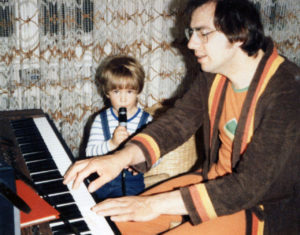 His father very often played piano in their tiny apartment and showed Andy his first chords and simple songs. Andy would accompany his dad Gary to rehaersals and concerts when he was very little. At the age of 12 , he got his first electric guitar. It was an old, discarded “department store- guitar” from a fellow musician of Gary. Since that day Andy started to practise autodidactically. Every now and then some of Gary`s fellow musicians showed him some chords, licks or riffs. Similar to that time Andy also discovered his passion for singing. It did not take long and his first band was found “The Hoochie Coochies”. He and 2 school mates first played 50ties rock`n`roll, due to the resonating influence of Andy`s father. With the band he later discovered the blues, then soul and funk from the 60ties and 70ties as well as classic rock Led Zeppelin style, Deep Purple and Jimi Hendrix. The young band played many cover songs of these genres. They later processed these influences into own compositions. Inevitably they became “queer fellows” in Berlin´s mid nineties music scene, where punk, alternative rock or hip hop was popular. Within 10 years the band evolved into an almost professional band with 6 members. In 1999/ 2000 Andy gained ground in the professional music scene. He took intense singing and piano lessons plus harmonics for many years. He dismissed the idea to study music very soon, when he failed his first entrance examination. He could not identify with the musical ideals of music universities. Similar reasons took part in collapsed co-operations with production companies, that wanted Andy as a clean and smooth pop star. During that time he was the lead singer of a well-known Berlin soul and funk band “Power Unit”, that had 11 members. They performed at the legendary „Quasimodo“ on a regular basis. Andy acknowledged that this was his destiny. Honest and straight handmade live music, high-level with lots of soul and groove. But he also found out about the challenges to make a living as a music artist in the early 21th century. That`s why he took on a day job as a cab driver. On weekends he performed in provincial towns of Brandenburg with the pop/ rock cover band “Interface”. But he did not feel satisfied with this level of musicianship. He needed the fees and was able to grow and learn from his older fellow musicians. It was obvious to him, that this was only a steppingstone. In 2002 Andy Robson met keyboard player and band leader Ludger Wirsig, living in Potsdam. Ludger, who is 10 years older than Andy, was also more experienced and established in Berlin`s and Potsdam`s music scene. Together with drummer Jakob Peter they found the „Ludger W. Trio“. Both played blues from German blues magnitudes like Heinz Glass and Big Joe Stolle in former bands and it was about time to go their own way and focus on soul and funk. The timing was right and Andy was the perfect match to take on his role as the singer and guitarist in the band. The „Ludger W. Trio“ is performing across Germany with great success for many years now. He also managed to graduate from university with a diploma as a qualified social education worker in 2009. At this juncture he collaborated with other music playing social education workers for the Berlin project “Rockmobil” in 2008 and became one of the tutors. Furthermore Andy Robson became a constant and evolving part of the wide Berlin music network and played many gigs as guest performer in various bands and short-term arrangements. In 2011 he finally found his own band „Urban Fox Connection“, he is band leader, frontman and composer. The first EP „Urban Fox Connection“ was released in the beginning of 2012. In summer 2011 he took on a one year engagement at the “Trans Europa Express” he joint the Scandinavian gala band and toured many months at cruises in the Scandinavian ocean. Since the end of 2012 Andy Robson focuses on „Urban Fox Connection“, as well as ongoing projects. The first extensive album of „Urban Fox Connection“ is about to be released in 2016.